By Neil Brodie, Policy Brief No. 3, July 2017, from The Antiquities Coalition. Online shoppers therefore have limited means of knowing what they are buying or from whom. This is a particularly serious concern given the industrial scale looting now taking place in Iraq and Syria, which the United Nations Security Council warns is financing Daesh (commonly known as ISIS, ISIL, or Islamic State), al Qaeda, and their affiliates. 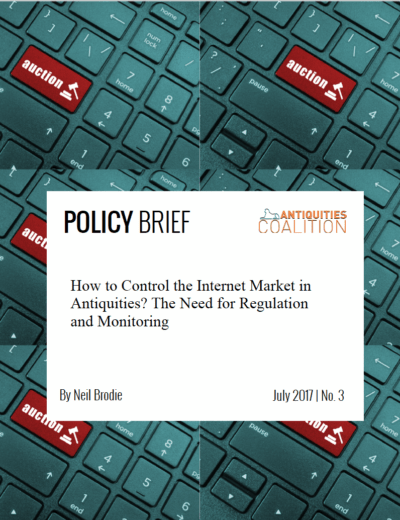 Despite the clear implications for both cultural preservation and national security, so far public policy has completely failed to regulate the online antiquities trade. This is particularly true in the United States, which remains the world’s largest art market and a major center for the internet market in antiquities. American inaction has 3 made it impossible to combat the problem globally, and moreover, is in great contrast to positive steps taken by other “demand” nations like Germany.